Tell Santa what you want from MM and be entered to win the item from the Mulberry Moon personalized jewelry and gifts web site! One winner daily – contest ends November 30, 2008. One submission per day. I personally would like the monogrammed quilted brown animal print extra large tote bag! It retails for $40.00 and it could be yours if you send santa@mulberrymoon.com an email about it. ‘Tis the Season for Personalization! Monogrammed jewelry is a classic holiday gift that says “I really thought about you when I picked this gift.” Mulberry Moon.com has a wonderful new selection of jewelry pieces available from Classic to Victorian, two-tone to trendy and an entire range of gifts that can be engraved. And as always…engraving is free! Order Personalized Gifts by December 18th to ensure Christmas delivery on in stock items. My friend’s seven year old daughter loves monkeys and is known to friends and family as the monkeylady. She recently started her own online monkey themed gift store and is saving for college. 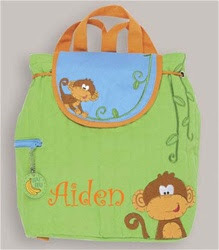 Check it out – it has the cutest monkey-themed personalized gifts! “Quilted Backpack with Monkey, one of my favorites. It has a drawstring top and a magnetic snap closure on the flap. My mom will put your name on this bag. Just choose your font and thread color. My favorite thread color for this bag is orange.” It is $26.50 and you can personalize it.